The votes are in and it’s official – the Allen’s Cola Frogs have proved victorious over the Unicorns in the 2019 Allen’s Loll-ection to secure a coveted place on Woolworths’ shelves nationwide this February. Record numbers of Aussies flocked to have their say in the sweetest election of the year, with Cola Frogs winning a stunning 65 percent of the vote. Leaping into their own solo bag, the newest addition to the Allen’s range will delight fans by bringing the best of two sweet worlds together, combining the iconic Frog shape that locals have adored since 1982 with the delicious cola flavour. Predicted to be a huge hit with all generations, Allen’s lolly experts are gearing up to make over 500,000 packets of Cola Frogs to meet the anticipated demand; enough to cross the Sydney Harbour Bridge ten times. Nestlé Head of Marketing Confectionery Anna Stewart said that this year’s vote will be one to remember as Aussies couldn’t be tempted by the huge unicorn trend, voting in favour of the fun-loving frog. “This was certainly an interesting election year as love for our favourite Frog shape, recreated in the nation’s favourite cola flavour took us all by surprise, as Aussies voted with their taste buds. “We’re thrilled to be able to give lolly lovers the sweet treat they want and deserve, and are certain that Allen’s Cola Frogs will spread smiles across the country when they land in stores next month,” Ms Stewart said. In an Allen’s Lollies and Australian first, lolly lovers also had the chance to taste the two contenders facing off in this year’s vote, resulting in a record turnout with over 38,000 voters. Fans still have time to purchase one of the few remaining jars from the Allen’s website. Unicorn fans need to act quick for a chance to get their hands on the magical lollies before they gallop off forever. 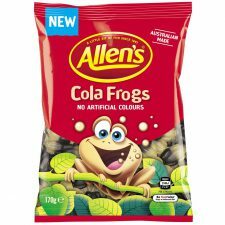 Allen’s Cola Frogs (170g) will be available exclusively at Woolworths from 28 February 2019, RRP $2.99.